TRAMORE TOWN: Migrant moths trapped tonight included a Tunbridge Wells Gem (2nd Irish record), Antigastra catalaunalis, Palpita vitrealis, Small Marbled, Convolvulus Hawk-moth & 3 Vestal. CLONEA STRAND: Balearic Shearwater, juvenile SABINE'S GULL, 3 Roseate Terns, 3 Arctic Skuas & 3 Mediterranean Gulls (2 adults & a 2nd-winter) at Ballinclamper. 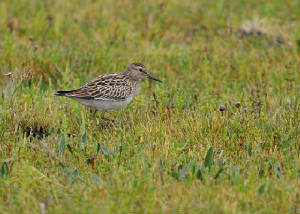 DUNGARVAN: 2 juvenile Ruffs & 3 juvenile Curlew Sandpipers at Ballyneety. 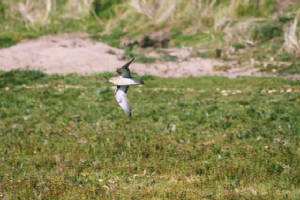 HELVICK HEAD: MARSH HARRIER & Arctic Skua. ARDMORE: 4 1st-winter Mediterranean Gulls at Curragh beach. 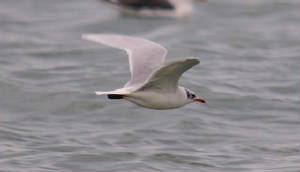 WHITING BAY: Adult Mediterranean Gull & 10+ White Wagtails. TRAMORE TOWN: Migrants moths included a Convolvulus Hawk-moth, Small Marbled, Scarce Bordered Straw & Vestal. 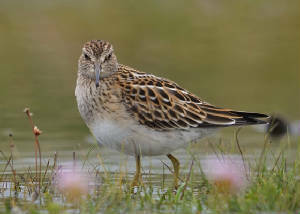 TRAMORE BACKSTRAND: Corncrake heard at Lisselan this afternoon. 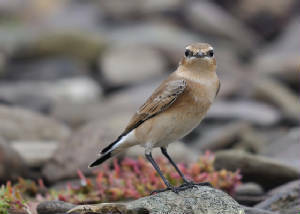 BROWNSTOWN HEAD: Arctic Skua & 12 Wheatears. 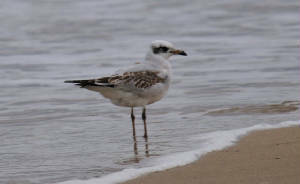 CLONEA STRAND: 1st-winter Mediterranean Gull at Ballinclamper. HELVICK HEAD: Juvenile SABINE'S GULL, Great Shearwater, 5 Balearic Shearwaters, 5 Sooty Shearwaters, 'Blue' Fulmar, 4 Storm Petrels, 2 Grey Phalaropes, 20 Great Skuas, 10 Arctic Skuas, 5 juvenile Black Terns, Little Tern, 20+ Roseate Terns, 3 Puffins & 1-2 Porpoises (seawatch 12:00-17:00), also a Merlin. DUNGARVAN: SPOONBILL on the Cunnigar. 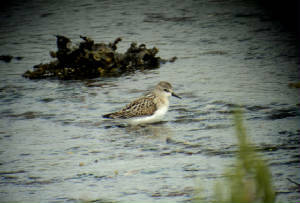 CLONEA STRAND: White Wagtail, 5 Roseate Terns, Arctic Skua and summer plumage Great Northern Diver. 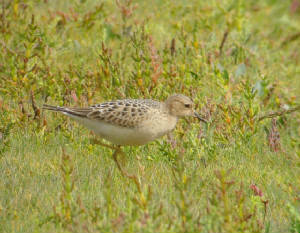 DUNGARVAN: Juvenile Curlew Sandpiper, juvenile Ruff, adult Mediterranean Gull & Green Sandpiper at Ballyneety. HELVICK HEAD: Up to 10 Blackcaps. TRAMORE BACKSTRAND: Kingfisher at Pickardstown. 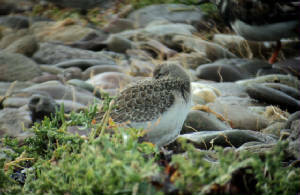 CLONEA STRAND: 6 Arctic Skuas, 2 Storm Petrels, 2 Grey Phalaropes & 2 Roseate Terns (adult & juvenile) off Ballinclamper. 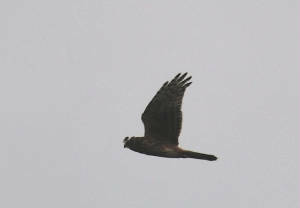 KNOCKMEALDOWN MOUNTAINS: Juvenile Hen Harrier. RAM HEAD: Balearic Shearwater, Great Skua W, Storm Petrel E, 7 Common Scoter E, 100 Common Dolphins & a Fin Whale (seawatch 08:30-10:10), also 13+ Wheatears. DUNGARVAN: First Redwing of the autumn, at the Pike. 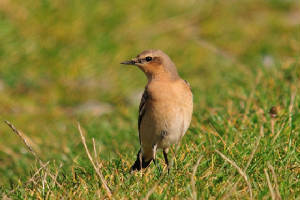 HELVICK HEAD: 3 Balearic Shearwaters, 2 Arctic Skuas & a Great Skua W & 8 Common Scoter W (4 E) (seawatch 07:55-11:00). 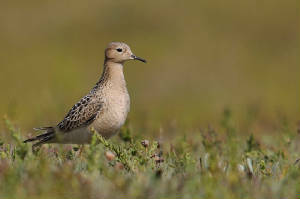 TRAMORE BACKSTRAND: Spotted Redshank west of spits, juvenile Little Stint & 3 White Wagtails off Lisselan, juvenile Ruff at racecourse lake, & 18 Brent Geese. SEAFIELD: Yellow Wagtail flew over. 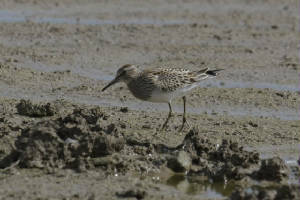 DUNGARVAN: 1 PECTORAL SANDPIPER, sub-adult SPOONBILL & a Curlew Sandpiper at the Cunnigar. WHITING BAY: 15 Tree Sparrows at Ballysallagh, 3 White Wagtails & 170 Ringed Plover on beach. 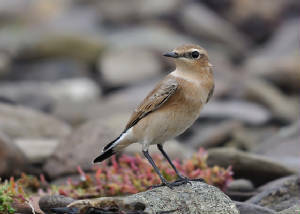 CLONEA STRAND: Arctic Skua W & 10+ Arctic Terns at Ballinclamper. WATERFORD CITY: 2 Swifts W with large numbers of Swallows & House Martins. HELVICK HEAD: 2 LONG-TAILED SKUAS (adult & juvenile), 2 juvenile SABINE'S GULLS, 3 Balearic Shearwaters, 10 Sooty Shearwaters, 2 Storm Petrels, 4 petrel sp (probably Storm), 1 Grey Phalarope, 2 Pomarine Skuas, 30+ Arctic Skuas, 8 Great Skuas, 3 juvenile Black Terns & 4 Porpoises (seawatch 09:00-12:30 & 13:15-17:30). BLACKWATER VALLEY: Otter opposite Dromana. HELVICK HEAD: Male and female Common Scoter at mouth of bay, Spotted Flycatcher & small numbers of Chiffchaffs, Blackcaps & Whitethroats. 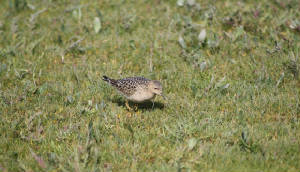 CLONEA STRAND: Juvenile Mediterranean Gull and 1-2 small skuas offshore. 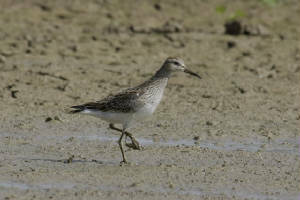 TRAMORE BACKSTRAND: Spotted Redshank at Pickardstown, 2 Spotted Flycatchers at Saleen. BROWNSTOWN HEAD: 7 Tree Sparrows & a Spotted Flycatcher . 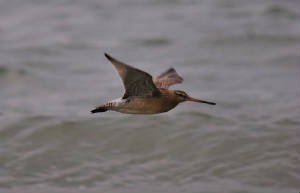 DUNGARVAN: Kingfisher at Barnawee and 2 Mediterranean Gulls (adult '3H97' & juvenile) at Ballyneety. 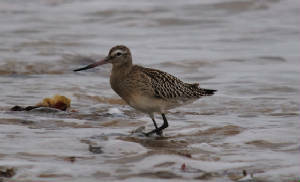 TRAMORE BACKSTRAND: Kingfisher at Clohernagh; Spotted Redshank (video) & 2 juvenile Curlew Sandpipers at Pickardstown. 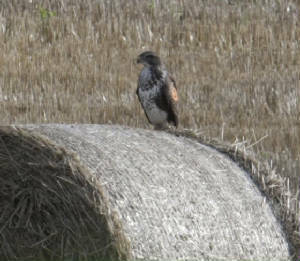 EAST WATERFORD: Wing-tagged Buzzard , ringed as a chick in east Cork. 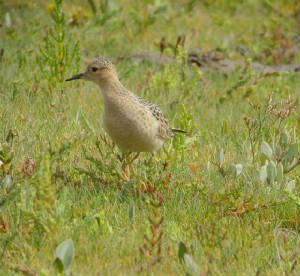 DUNGARVAN: Juvenile Mediterranean Gull & 2 juvenile Curlew Sandpipers. 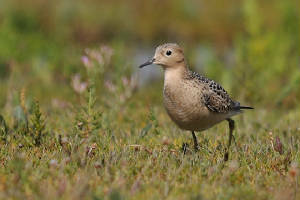 WHITING BAY: Juvenile Mediterranean Gull. VARIOUS: White Wagtails at Ballinclamper, Ballyquin, Ardmore & Whiting Bay. 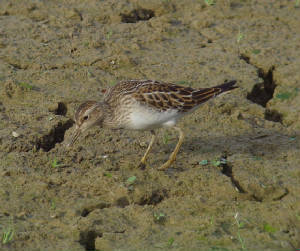 DUNGARVAN: 2 BUFF-BREASTED SANDPIPERS & a PECTORAL SANDPIPER at the Cunnigar. HELVICK HEAD: 5 Storm Petrel (4 W), 2 Great Skuas W, 4 Arctic Skuas (2 E, 2 W), Little Tern W, 25+ Arctic Terns & a Porpoise (seawatch 09:55-11:55). 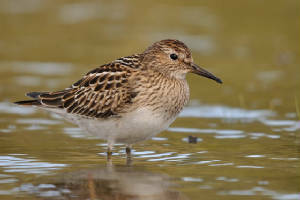 KNOCKADERRY RESERVOIR: 2 Common Sandpipers & a White Wagtail. BALLYSHUNNOCK RESERVOIR: Whooper/Mute Swan hybrid (video). CLONEA STRAND: 4 White Wagtails at Ballinclamper. WHITING BAY: 2 White Wagtails. 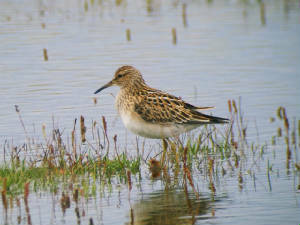 DUNGARVAN: 2 BUFF-BREASTED SANDPIPERS (video), 2 PECTORAL SANDPIPERS (video), SPOONBILL (video), 3 Curlew Sandpipers, juvenile Mediterranean Gull & a Spotted Flycatcher at the Cunnigar. HELVICK HEAD: 3 adult SABINE'S GULLS, single Balearic Shearwater, Sooty Shearwater, Storm Petrel, Grey Phalarope, small numbers of Arctic Terns, & a Porpoise (seawatch 13:48-14:48). CLONEA STRAND: 4 Roseate Terns, 2 Arctic Terns & 4 White Wagtails at Ballinclamper. WATERFORD CITY: A late Swift over the quay. 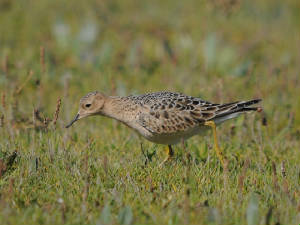 juveniles), juvenile Little Gull, & 2 Little Terns, also 1000+ Manx Shearwaters W per hour (seawatch 12:00-18:00). 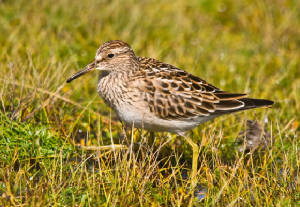 DUNGARVAN: BUFF-BREASTED SANDPIPER, 3 PECTORAL SANDPIPERS & a Curlew Sandpiper. WHITING BAY: 3 Great Skuas. 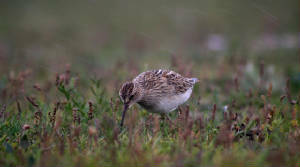 ARDMORE: 2 Mediterranean Gulls (adult & 1st-winter) & Comon Sandpiper at Curragh beach. 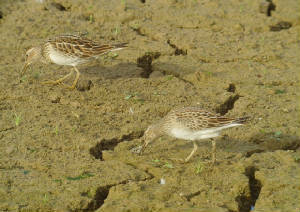 KILMEADEN POOLS: 2 juvenile PECTORAL SANDPIPERS still present, also 3 White Wagtails. 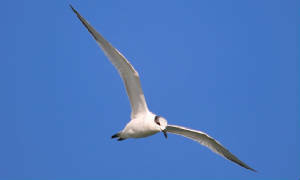 CLONEA STRAND: 12 Arctic Terns at Ballinclamper (video) . RAM HEAD: Balearic Shearwater, Sooty Shearwater, Great Skua & Puffin W (seawatch 17:10-18:40). 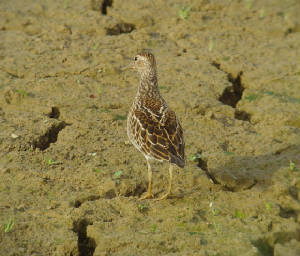 KILMEADEN POOLS: 2 juvenile PECTORAL SANDPIPERS (video) & a Chough. 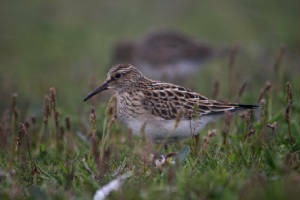 CLONEA STRAND: Adult Roseate Tern & 4 Arctic Terns at Ballinclamper, 4 Sooty Shearwaters off Ballinard. 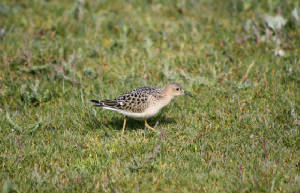 ARDMORE: 2 Mediterranean Gulls (adult & 1st-winter) & an Arctic Skua. GLENDALOUGHIN (nr Nire Valley): 2 Gem moths. DUNGARVAN: 2nd-summer Mediterranean Gull at Barnawee. 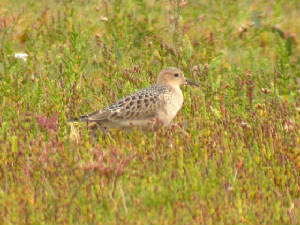 CLONEA STRAND: Juvenile Ruff, juvenile Mediterranean Gull & 4 Arctic Terns (2 adults & 2 juveniles) at Ballinclamper. GLENDALOUGHIN (nr Nire Valley): Gem moth. 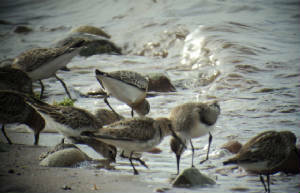 DUNGARVAN: 3 PECTORAL SANDPIPERS, 5 Curlew Sandpipers, juvenile Little Stint & a Pomarine Skua at the Cunnigar; 3 Curlew Sandpipers & an adult Mediterranean Gull at Ballyneety. 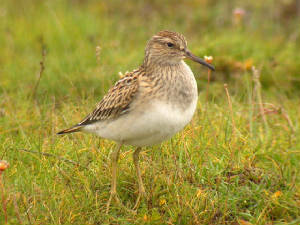 DUNGARVAN: Juvenile BUFF-BREASTED SANDPIPER & 2 juvenile PECTORAL SANDPIPERS still present on the Cunnigar. 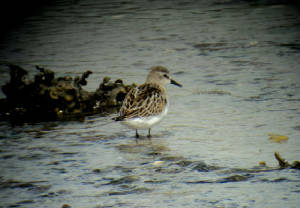 WHITING BAY: 6+ Little Stints, 2 Mediterranean Gulls (adult & juvenile), a Merlin & 8+ White Wagtails. 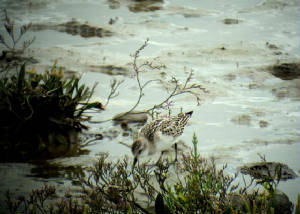 WHITING BAY: PECTORAL SANDPIPER, 2 juvenile Little Stints (video), 2 adult Mediterranean Gulls & 2 White Wagtails. 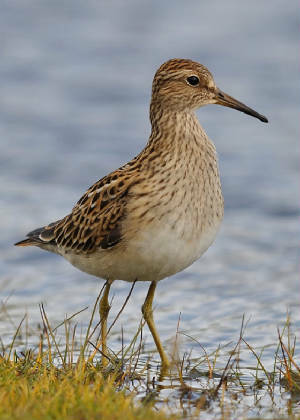 DUNGARVAN: Juvenile BUFF-BREASTED SANDPIPER (video) & 2 juvenile PECTORAL SANDPIPERS on the Cunnigar, Little Tern at Ballynacourty. 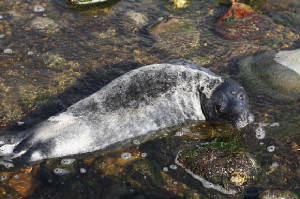 HELVICK HEAD: Sooty Shearwater, 305 Manx Shearwaters, Puffin & 2 Arctic Terns W (seawatch 17:20-18:20). Off BALLYVOYLE: Pomarine Skua, 5 Sooty Shearwaters & several hundred Manx Shearwaters from boat. 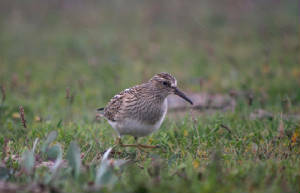 DUNGARVAN: 2 juvenile PECTORAL SANDPIPERS (video), sub-adult SPOONBILL, 12 juvenile Curlew Sandpipers, juvenile Little Stint (new bird), juvenile Little Gull, 2+ White Wagtails & 50+ Wheatears at the Cunnigar; near-adult Yellow-legged Gull & 3 Green Sandpipers at Ballyneety. 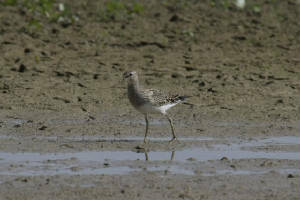 CLONEA STRAND: 10 White Wagtails & 89 Ringed Plover. BROWNSTOWN HEAD: Balearic Shearwater, 384 Manx Shearwaters & Great Skua W, 2 Arctic Skuas E (seawatch 07:40-10:40); 2 Tree Sparrows. 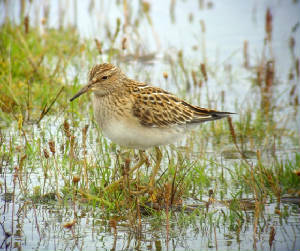 DUNGARVAN: 10 Curlew Sandpipers & 8 White Wagtails at the Cunnigar. 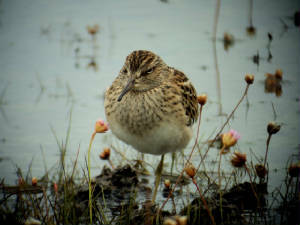 DUNGARVAN: Juvenile Little Stint, 3 Curlew Sandpipers, juvenile Arctic Tern & a Whinchat at the Cunnigar. WATERFORD CITY: Spotted Flycatcher near the Whitfield Clinic.